After our abysmal display midweek away at Liverpool, a game that seems almost a century ago, I was so quick to write my reflections that I caught my lap top unawares and it almost broke as a result, especially as I thumped the keys in frustration. Tonight, I’m similarly quick on the draw, but my fingers, one finger typing an’ all, are gliding over the keys. That was an outstanding performance tonight, an effort that if it had been Chelsea, City or even the RS, the media would be – well, let’s just say over-excited. Once again, in our favour this time, the stats won’t quite tell the story, except the only stat that really matters, the final score. Conceding majority possession to Swansea is one thing, but to the Bar Codes is altogether another. On this showing, they’re lucky to already have enough points in the bag not to worry about very much this season. But to suggest that we only won because Newcastle have got nothing to play for would be a gross underestimation of the quality of our football tonight, and let’s be fair, apart from one glaring miss by Anita (the Newcastle player, not my cousin) and a bit of ping pong in the box early doors, the Skunks hardly had a sniff with their 55% possession. And if Gerry could pick out that last pass in the box, or if our players could work out when he’s going to nudge it across the box, we probably could have scored plenty more. Deulofeu did tonight what I’ve been saying we need to do more of now that oppositions have sussed out our attacks down the flanks with Baines and Coleman – go direct. I don’t like to say “I told you so”, but still. I told you so. And Barkley was up to it as well. Much more running at defences, and you can see the impact – you only have to think of yourself in an opposition coaching session when they start thinking ‘how the hell are we going to stop them? They come at us down the middle, they come at us down the flanks, at least they don’t lump long hopeful balls in to the box a la Stoke (of old)’. That’s what we want – sides wondering more about how to stop us, not how to beat us. Watching a whole game on an iPhone is a first for me, so forgive me if I couldn’t quite get every movement off the ball, or nuance of attack or defence. Given a 0-3 victory, I have a feeling I could be forgiven most things. The back four looked more solid, one or two wobbles from Young Stones (that’s his full name), and less marauding from the Full Backs because they didn’t have that brief. Give it to Gerry and let him do the rest. Stones did go awol a couple of times, especially after his bang on the head (the Marketing department are delighted, just imagining how many things we can put the image of Young Stones’ bleeding head on to and get in to Everton 1 and Everton 2 – might be too gruesome for the window displays for fear of frightening the Lids), but there was one sublime moment when the ball was knocked in to him, and rather than head clear, he brings it down on his chest, traps it, gives it, and the move starts. Class. This lad can play. Time will get his positioning better (and there’s no doubt he’s dropped right away when Jags is ready), and time will hone what already look like exceptional skills. McCarthy staggers me. I could almost give him MotM every week because of the ground he covers – one exceptional moment for him was when he ran after the loose ball played back by their defence and charged down the keeper in his 18yd area. That’s our Defensive Midfielder there. He is Ball-esque in the ground he covers, he tackles with bite, and he’s perfected the simple pass. He hasn’t got many goals in his locker yet, but maybe that will come. 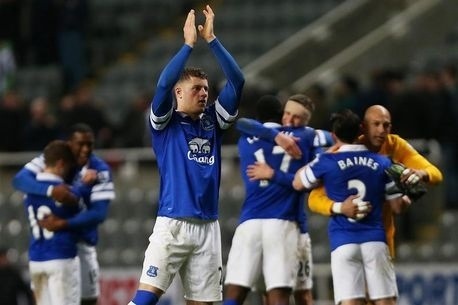 But so long as Rom and Ross are banging them in up front, who cares if he does or doesn’t. I think a young prospect called Osman scored a delectable third. He has, quite rightly in my mind, had some stick from Blues, as the consensus is that he’s had his best days, and he is too lightweight in the tackle. Frankly, he makes Neymar look like Akinfenwa. But tonight, he made the most of his 8 Stone frame, and focused on his s strengths – he has always had quick feet, and provided he doesn’t try to take on the whole defence, he can beat a man and still play a pass. We need that, and his cameos this season have been just right. Maybe that’s what he is now, a cameo performer. It comes to us all, in my case about 25 years ago on a rugby pitch (less cameo, more camel). Rejoice after this win everyone, it was a superb tactical and fought out win, and United lost and Arsenal drew. Who cares. Just keep winning Blues, and we’ll end up where we’ll end up. Who knows…..? but …. as Ross states ‘And if Gerry could pick out that last pass in the box, or if our players could work out when he’s going to nudge it across the box, we probably could have scored plenty more.’ we were the better team. deserved the win.